Made In USA. JPMA certified. 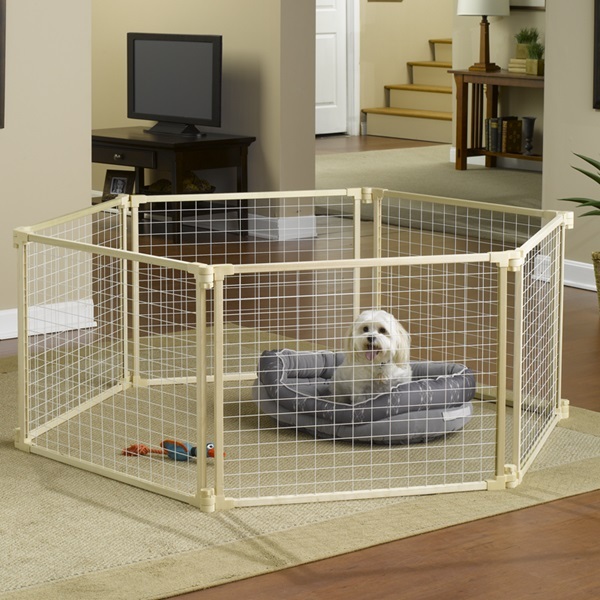 6-panel Wire Mesh Play Yard with Sun Shade is made of heavy duty wire mesh with an unfinished American Hardwood frame. Each 33” panel has Easy Release hinge locks to allow it to be manipulated into many shapes and locked into place. The hinge locks can be opened to create a barrier for a fireplace or stairway using the included mounting hardware or can be used free standing as a play yard. For Indoor and Outdoor use. It features a 6 panel sun shade for protection from sun and wind. Includes yard stakes and a matching Carry-All Pack for portability. 25”(H). Provides 21 sq. ft. of space. Additional 2-pack panels are available to increase size.